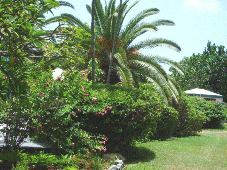 The plants of the Virgin Islands are one of the most delightful and entrancing aspects of the island environment. They add their rich greenery and colorful, sweet-scented flowers to the beauty of this tropical paradise. Before European settlement, much of the islands were covered in forest. When the early plantations were established, a large percentage of the original forest was cut down. It was displaced by sugar cane, cotton, tobacco, and other crops. Later, as plantations disappeared, the forests began to recover. In recent years, as people have adopted a less rural lifestyle, with less reliance on forests for firewood and building materials, the forests have recovered even more. 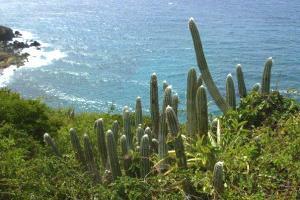 Also, in recent decades many of the native and introduced plants of the Virgin Islands have spread again. They've had a chance to take hold and grow over areas that had been under cultivation for centuries. The amazing variety of plants of the Virgin Islands is largely due to the variety of climate zones and habitats that you see. 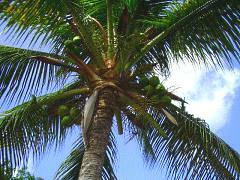 On the tropical coastlines you find many kinds of palms, including coconut palms. You'll also see seagrape, all sorts of flowering plants, red turpentine trees, and mangroves and the swamps that they form. On the moist hillsides which cover much of St. Thomas and St. John, you see a huge range of trees, bushes, bromeliads, and flowering plants of all kinds. Here's where you'll find many species of orchids, some quite rare. On the eastern side of the islands, were there's less rainfall, you'll see arid semi-desert areas. You might be surprised to see several species of cactus including prickly-pear; also other dry-zone plants like agaves and acacia trees, as well as a whole range of arid-loving scrub plants. And among the plants of the Virgin Islands on St. Croix, you see substantial areas of open pasture and grasslands. On the northwestern section of the island, there's a substantial area of moist forest (called the "rain forest", although it's technically not a rain forest). Of course, beyond what you see growing wild, there's also the huge array of plants you see in people's yards and gardens. Beautiful flowering plants of the Virgin Islands like hibiscus, poinsettia, allamandas, and bougainvilleas seem to be blooming everywhere you look. 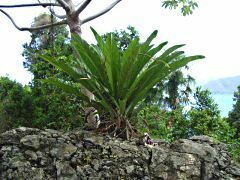 A wide array of fruiting plants and trees like bananas,mangoes, papayas, breadfruit, and soursop trees grow all over the settled areas of the islands. You'll also see tamarind trees with their long seed-pods and calabash trees with the large gourds they produce hanging from their branches. 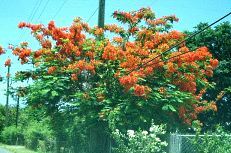 One of my own favorites plants of the Virgin Islands is the Flamboyant Tree, a spectacular tree which flowers with remarkable bright red-orange blossoms in mid-summer and creates blazing splashes of color around the islands. Read on to see a short list of a few of the trees and plants of the Virgin Islands you're likely to see. Manchineel Tree: This is the scariest tree in the Virgin Islands! It grows throughout the Caribbean, and has ferocious natural defenses basedon the highly caustic, acid-like chemicals which grow throughout its tissues and fruits. Just brushing up against the leaves or lightly touching the barkis enough to give you a nasty, irritating rash. Christopher Columbus referred to the fruit of the manchineel as "death apples"! Mahogany: Although there's no commercial lumber industry in the Virgin Islands, you do occasionally see mahogany trees in the forests. They were originally imported to the islands from South America, and now grow in the wild. Calabash: The calabash is a tree that you often see growing in yards or on the side of the road in the countryside, especially on St. Croix (though it grows on St. Thomas and St. John as well). It's a small to medium sized tree, growing to around 30 feet tall, and it produces the large gourds of thesame name. The gourds are not edible, but were traditionally used (and sometimes still are) to make bowls, jugs, and other containers. Strangler Fig: As the name suggests, the strangler fig is a tree that puts out vine-like growths which grow up around a "host" tree. It slowly grows up and around the other tree to the point that the "victim" is gradually smothered or strangled by the strangler fig. You can see these trees in the more heavily forested areas, especially on St. John and in the St. Croix "rain forest". Bay Tree: This tree is a member of the Laurel family, and its leaves are used to make perfumes, flavor foods, and as a key ingredient in the world-renowned "Bay Rum". Flamboyant Tree: This beautiful, smallish tree blooms in the summer with phenomenally bright, large, red-orange or yellow flowers all over the tree. These trees create tremendous splashes of color around the islands. You often see them growing in yards, on roadsides, and even in parking lots! and public facilities. 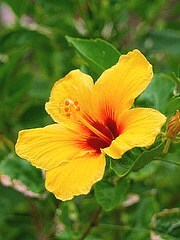 Different species of hibiscus produce blooms in pinks, yellows, peach-colors, and others. brightly-colored "blossoms" are actually not flowers at all, but modified seed-bracts that mimic flowers in their bright colors, which range from pinks and purples, to bright reds, to orange and yellow. Frangipani: Pretty flowers which often grow in clusters and are commonly either white fading into yellowish centers or pink fading into yellow or orange centers. They have bright green, distinctly veined, elliptical leaves. Ginger Thomas: The official flower of the Virgin Islands. Actually, it's a native of Florida, Texas, and New Mexico! Fragrant, bright yellow flowers and green leaves that were used traditionally for medicinal purposes. Banana: You see all kinds of bananas growing in gardens, people's yards, and out and about on the islands. The banana plant is often thought of as a tree, but, despite its palm-like appearance, it's actually an herb! The banana has its origins in Southeast Asia and Australia. Papaya: Native to Central and South America, the papaya is one of the most common plants of the Virgin Islands. 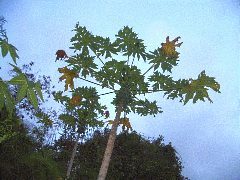 Papaya trees are small, usually fifteen to thirty feet tall, with a narrow, straight, unbranched stem. They have flaring, palm-like fronds near the top. The sweet fruits grow in clusters just under the flaring leaf-fronds. In the islands, the fruits are used for all sorts of preparations, including in tarts, sauces, and preserves. Mango: A good-sized tree, growing fifty feet or more tall. Puts out great-tasting, sweet, messy-juicy fruit! The fruits are about six inches long and turn yellow, red or orange as they get ripe. Originally from India. Very popular, great for fresh eating or in all kinds of drinks, desserts, and even ice-cream! Soursop: Soursops are large, pale green, roughly oval-shaped, knobby fruits. They grow on smallish, bushy evergreen trees. The fruits get big, up to a foot long. When ripe, the fruits are smelly, but the creamy insides are sweet and tasty. The birds love them, too! Sea Grape: Grows right on the beaches or near the shoreline. The plants are low and bushy, with wide, light-green leaves that are shaped like grape-leaves. They're very tough plants, able to withstand the saltiness and wind of the beach environment. They put out grape-like berries that grow in clusters similar to bunches of grapes. The fruits turn from green to deep red or purple as they get ripe. The fruit are somewhat sour, but they're sometimes used for making preserves. Century Plant: The Century Plant is a member of the agave family. Its name comes from the fact that it flowers only once every ten years or so. 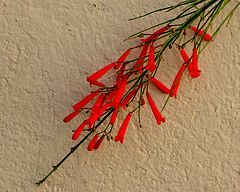 The flower forms on a long stalk which grows up from the middle of the plant. The stalk can grow several feet in a matter of days! Air Plants: These interesting plants don't need soil to grow. You see them growing on rocks, tree trunks, and branches. They're members of the bromeliad family, and get all the moisture and nutrients they need right from the air. 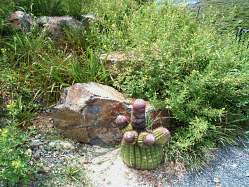 Cactus: Many people are surprised to learn that the plants of the Virgin Islands include several different species of cactus! Barrel cactus and prickly-pear are two you'll see commonly. You'll find them mostly in the arid eastern end of the islands.